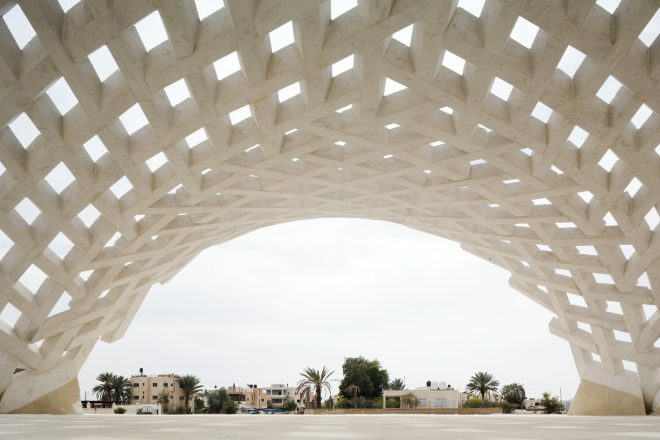 Palestine suffers of a misuse of stone as a structural material: while it was an abundant material used for structural purposes in the past, it is now used as a cladding material only and the know-how of stone building is disappearing. The research aims at including stone stereotomy – the processes of cutting stones – construction processes in contemporary architecture. It relies on novel computational simulation and fabrication techniques in order to present a modern stone construction technique as part of a local and global architectural language. Our research department – SCALES – and GSA (Geometrie Structure Architecture) ENSA Paris-Malaquais are leading this research on stone construction techniques. The results of the research will be used to build the el-Atlal artists and writers residency in Jericho. As such, Stonematters is the first module of the residency and the first built vault of our research. Stone matters is built on an innovative construction principle allowing for unprecedented forms for such structures. The architectural innovation is born from structural morphology and stereotomy. The vault covers a surface of 60 m2 and spans 7 meters with a constant depth of 12 cm. The geometry follows the shape of a minimal surface on which geodesic lines are drawn and set the pattern of the interlocking stones. The whole structure is made of 300 mutually supported unique stone pieces. 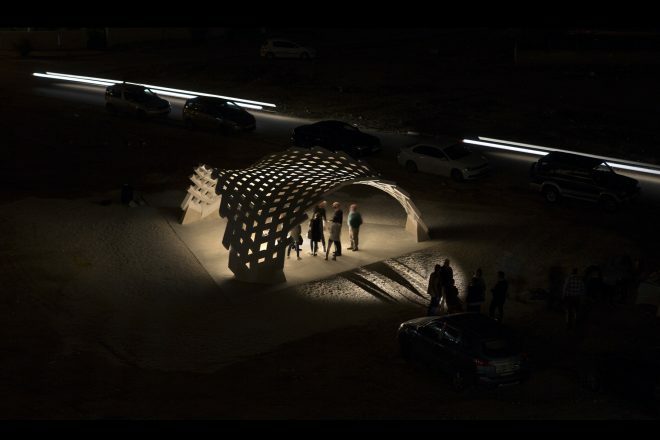 Beyond the scientific and technical issues that make Stonematters a unique object, the project represents as well a cultural challenge: it has been entirely built with available know-hows in a peripheral zone of the culturally marginal city of Jericho. Processes of several factories have been combined in order to use existing known techniques for new uses. The polystyrene blocks, for example, have been roughly cut in a factory and transported to another for a robotic carving process. 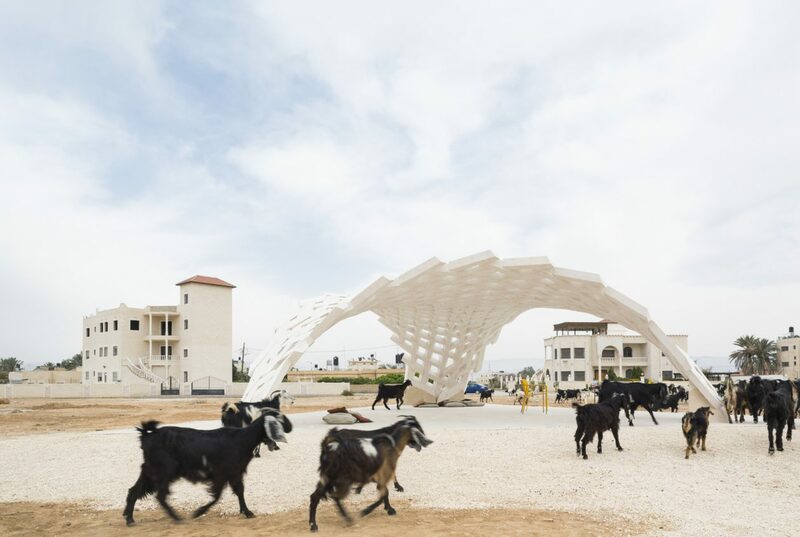 Right after its completion Stonematters attracted curious inhabitants of Jericho and elsewhere in Palestine, putting together the seeds of the future el-atlal artists’ and writers’ residency. Through the understanding of our historical cities the research tries to link techniques of constructions to urban morphologies. It puts a non-hierarchical hypothetical link between the scale of stereotomy and the scale of urban fabric. In that context, the idea is to suggest new urban morphologies linked to the scientific use of a largely available material in Palestine.